As fall comes to a close, our beautiful city of Santa Fe, New Mexico, turns into a winter wonderland. The kiva fireplaces are roaring, filling the city with a smoky aroma. The air is crisp as the weather cools down but still comfortable enough for a stroll. 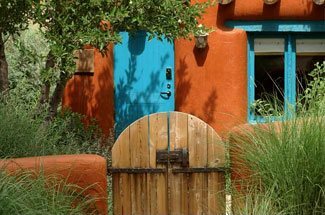 There are so many things to do in Santa Fe in the winter; come stay at Four Kachinas and see for yourself! There are so many things to do in Santa Fe in the winter, especially the outdoors. One of our favorite outdoor winter activities is cross-country skiing. As the weather begins to cool in the winter, the neighboring Sangre de Cristo Mountains begin to be dusted with snow, creating gorgeous scenery. Cross-country skiing is the perfect way to experience the gorgeous landscape in the snow! Indulging in delicious cuisine is one of the best aspects of Santa Fe. At the Santa Fe Cooking School, you can take some New Mexican cooking skills home with you! If you are looking for things to do in Santa Fe in the winter, some indoor activities will most likely interest you. Take a class or two during your stay at Four Kachinas. This cooking school offers a variety of teaching styles from hands-on classes to demos. This is your chance to master Southwestern flavors! One of our favorite things to do in Santa Fe in the winter is relax at a local spa. The winter can be a very stressful time of year with so many holidays and events. You deserve a relaxing getaway! A massage might be exactly what you need to start your vacation off right. With so many to choose from, you are sure to find the exact treatment you need. 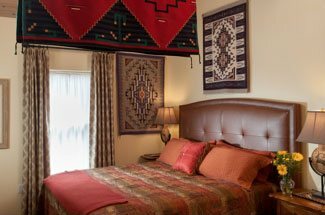 You’ll love staying at Four Kachinas during the winter months. Our bed and breakfast is located in the heart of the city, so it’s by tons of options for things to do in Santa Fe in the winter. If you still need ideas, the innkeeper and staff will be happy to help! No matter what activities you decide to do, you will always enjoy coming back to our cozy inn. Each room is uniquely decorated with Southwestern decor, and many have their own private patios and entrances. After your restful night’s sleep in your cozy room, join us in the morning for a delicious homemade breakfast to start your day off right. We look forward to seeing you at Four Kachinas this winter!